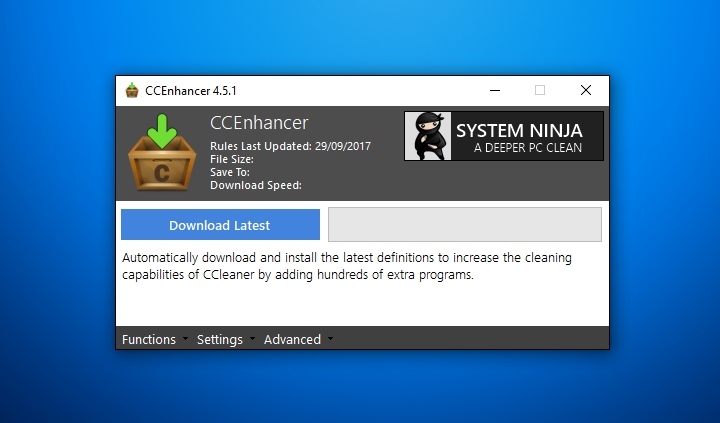 CCEnhancer is a small tool which adds support for over 1,000 new programs into the popular program CCleaner. The tool uses the winapp2.ini system built into CCleaner to easily add new rules and definitions for programs. The rules were sourced mainly from the Piriform Support Forum, with several sourced from other places around the internet. Directly download the winapp2.ini file here. Agent_xs, Winapp2.ini & TwistedMetal from Piriform Forums | Piriform for creating CCleaner to begin with | Microsoft for the .NET Framework | Everaldo Coelho for the icon. When used correctly, you should see more programs appear in the CCleaner menu. winapp2.ini is licensed under the Attribution-ShareAlike 4.0 International (CC BY-SA 4.0) license.